Last week I read this post from MTL Blog. They listed Photography as a useless degree and "EVERYONE is a “pro” photographer these days, your dad, your uncle, your best friend, even your dog has his own Instagram account." I had to vent on my Facebook, but ultimately I know that what they said is a reflection of what the general opinion is. Photography is very accessible these days, it's been somewhat de-mistified, anyone with the camera can take photos, but being a pro is a whole different ballgame, and I don't think people see this distinction anymore. I would like to shed some light on the matter. I am somewhat at the beginning of my photography career, so I'm just starting to face the challenges, but I can tell you now, photography, although fun, it's one of the toughest industries to make it in. For a number of reasons. I've been doing photography for a good while now. I first started learning it on my own, playing with the camera, fascinated by what it can do. I then started spending hours at the library reading photography books and getting inspired. I got better gear, but I didn't feel I was in control yet. I then went through 2 years of (very challenging) photography school and freelanced on the side. I got the hang of it by now, I know what I'm doing, but trust me, I still feel I have so much more to learn. It's true, capturing an image onto a sensor, then applying some filters even a 5 year old can do it. But understanding light & equipment to such a level that you can manipulate ambient light, highlights and shadows in a studio or on location, well that's a whole different ballgame. And you have to be artistic and creative and you need to know how to frame an image, and to anticipate moments and to direct people, and to plan a photoshoot and work in teams, and...that's usually not enough. Nowadays you have to know retouching too and maybe be a videographer as well, maybe have some graphic design skills too…And you have to do all that really well. Which takes me to my next point. Yes, you gotta be a bit of a workaholic to be able to keep up. There's no easy way to do this or to cut corners. Your work day doesn't stop at 5 and your weekends aren't just for you anymore. It's true, I do somewhat make my own schedule, but I work when and wherever I can. I write blog posts when I'm on the metro, edit at 2 am, I listen to tutorials while I'm cleaning, drinks with friends can turn into client meetings and so on. When you're not busy with clients you gotta get busy looking for clients. It's round the clock, and it doesn't stop. You really have to love what you're doing, or else you'll eventually quit, as it's just not worth it. To make it in photography you absolutely need to treat photography as a business. Whether you are a one man show or a bigger team, you are running a business. You need to register, you need to file your taxes, collect sales tax, have contracts & invoices, price your services, and be able to sell them to enough people so that you generate a profit. And this on an ongoing basis, aside from taking photos and other creative stuff. And you gotta be better than the competition, which comes from other pros and from uncle Joe who thinks he's a pro. And it's getting tougher and tougher. Cameras get better and widely accessible, so you have to figure out other ways to add value to your clients and to be creative. And wait, I didn't even talk about actually starting up, planning what type of photography you want to do, and what type of equipment you'll need and whether you'll need a studio, and so on. So once you decided that photography is your business, you have to get out and find clients. You have to go get business cards, a website, you have to cold call, send e-mails, network, meet people, be involved in all sorts of activities and creative projects, and so on. And it's true, with the Internet the whole world is open and the possibilities are endless. But the internet nowadays is one noisy place. Social media has become one complicated and time consuming endeavour, but you gotta do that too; it's PR and part of your business. You gotta be on Instagram, Facebook, Twitter etc., have a website, a blog, write constantly, take photos for social media, and research interesting topics for your audience. You gotta be a one man magazine & a blogger, or maybe a vlogger, with constant updates and interesting things to share. And you have to be prompt in answering emails and in your customer service. 5. You have to deliver quality…over and over again. So once you've got heard and you had your client meeting and you have the contract signed and everything, now it's finally time for you to be a photographer. And you have to be good, as good as you promised in your portfolio that you would be. No, actually better! You have to exceed expectations. Actually in my eyes this is one of the key differences between a pro and an amateur: reliability; the fact that you can constantly deliver what is expected of you. The way I see it, the amateur takes photos while the professional makes photos. And what I mean by that is that, while the amateur just takes pretty snapshots of the world around cuz he's got a cool/good camera, the professional brings his whole expertise into the photoshoot: from camera technicalities, to lenses, to lighting, to framing, to timing & anticipating, to directing and creating, and building sets and using props. And you know when you sign him up that he will deliver the images you expect. Yes, let's not forget that photography is an artistic endeavour, first of all. If you're a pro, then by now you've developed your own photographic style, your way of seeing the world and of expressing creativity. Maybe it's in the way you frame, or light, or capture the subject or post process…But you still have to constantly be inspired, follow the creative trends, know what new gear and programs come up, and find new ways to create cool stuff. So while you work on your business side of things, you have to keep the artist alive and always feed your imagination. You have to find creative minds to surround yourself with and do collaborations. In my case, while photography and retouching are my main thing, I recently found my inspiration in doing makeup. I'm also following a whole bunch of blogs, and I am constantly going through magazines, mainly looking at the photos, to be up to date and get inspired. I try to find inspiration in everything and to keep my brain thirsty even more I blog about creative stuff. The way I see it is that formal education in photography is not mandatory or absolutely necessary, but it is extremely useful. I've been through that, it was awesome (I'll probably write a blog post about that too), but it's true, you can learn all that your own (hmm…-ish), there's a lot of material online, but in some form or another you have to get an education. You have to know your equipment, your software etc. and you have to keep learning. I always watch tutorials or classes on Creative Live or read blog posts or simply hang out with other photographers around photoshoots. There's always something new to learn. And you know what I mean by that; you have to take your trade seriously and have full respect for your clients, and demand to be respected in return. You have to be organized, punctual on meetings, and deliver a high quality product within deadlines. And your image, online and otherwise, has to be pro as well…and with social media nowadays, word travels at the speed of typing…i mean…mess up one photoshoot, it can ruin your career. So never promise if you can't deliver. If you're a pro, than you most probably have your goals that motivate you. Photography is tough business and you need to accept both success and failure as part of the game and not give up. You'll have setbacks, you'll lose confidence, but you just have to push through. I think that two of my main strengths in life are that I am really ambitious, I aim high, and then I am really stubborn, as in I don't see any other outcome but me getting there. I'm not sure how much of this is determination, but I have my ways of (eventually) making things work. 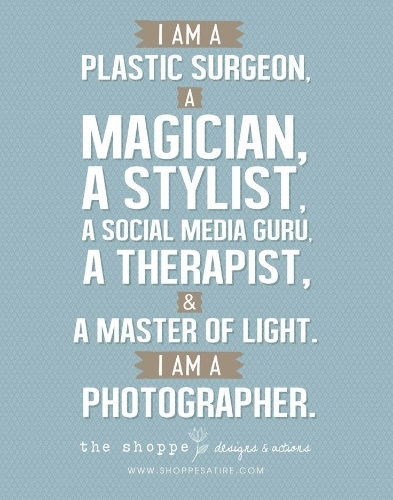 So yes, being a pro photographer requires so much more than just clicking a button and taking pretty snapshots. It's hard work; much harder than in many regular 9-5 jobs, and a lot of the time the only thing that makes it worth it is the love for the trade. It's true, it's unconventional and there are many perks, but so are the challenges. My point through this blog post is not to complain but to educate and inform. Being a pro photographer is a respectable career choice just like any other, and making it to that point, in my opinion is truly an accomplishment. I would love to see your comments on this; especially my fellow photographers: what challenges do you face? I'm sure there are many more to be said.